Today we begin a conversation I call “Eating with Jesus.” It’s my contribution to our emphasis on the relationship of an Open Table to our call to Mission, which is being underwritten by a Vital Worship grant from the Calvin Institute of Christian Worship. While most of the sermons in this series will draw from the New Testament, I thought it might be good to start with a story from Genesis about the day that Abraham and Sarah welcomed God to their Table. To give a bit of New Testament support to my thesis, consider this word from Hebrews 13: “Do not neglect to show hospitality to strangers, for by doing that some have entertained angels without knowing it” (Heb. 13:1, CEB). When we come to Genesis 18, it’s good to know that God has already made a covenant with Abraham and Sarah, promising that their descendants would be a blessing to the nations (Genesis 12). The Christian message is rooted in that covenant. In these verses we’re invited to reflect on what it means to show hospitality to the stranger, and what this says about our call to mission in the midst of God’s creation. In preparing the grant application, the image of the Table as crossroads was suggested. 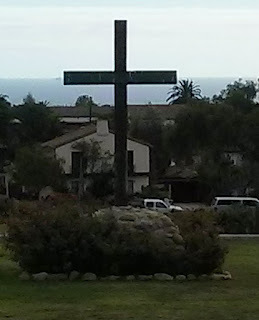 That is, the Table is a place where we meet Jesus in our comings and goings in life. That is true whether we’re lifelong members of this congregation or we’ve never set foot in a church. When we gather at the Table Jesus is present, meeting us where we’re at. In fact, it’s quite possible that we who have been part of the body of Christ all our lives might meet Jesus in the stranger who comes to the Table with us. The story before us occurs on the day “the LORD appeared to Abraham at the oaks of Mamre.” The word “LORD” here refers to Yahweh, to God. The question is—how does God appear to Abraham? As the story continues, Abraham sees three men standing near him, suggesting that God meets Abraham in these strangers. True to custom, Abraham runs out to welcome them to his home. I want to throw something out here as a topic of conversation. You see, through the ages, many Christians have seen the Trinity portrayed in these three visitors to Abraham. 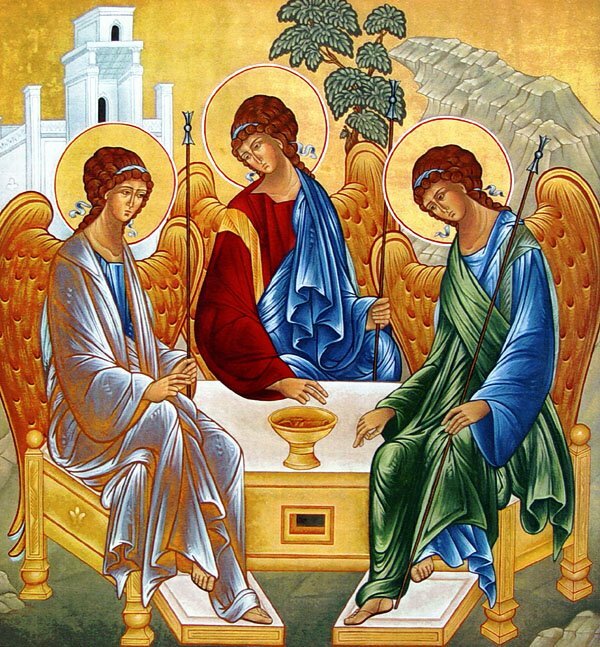 In fact, one of the most beloved icons of the Eastern Church is Rublev’s icon of the Trinity, that seems to portray three angels seated at a Table. Whatever we might make of this image, standing at the heart of Abraham’s encounter with the three strangers is a call to hospitality. That leads to another question: who is the stranger in our midst? In answering these questions, let’s try to envision times when we shared meals in the company of strangers. It might have been the first day of school in a new community. I don’t remember how that first day went when I entered a new school as a fourth grader. I imagine I felt a little intimidated, but maybe the reason I don’t remember what happened that day is that my new classmates showed deep hospitality. Just recently, some of us shared a meal with our friends from the Turkish American Society. Brett and I were seated at a Table with people we’d never met. At first, you’re not sure what to say, but before too long conversation begins, which enriches your life. What if God is “a stranger on the bus tryin’ to make his way home?” Indeed, what if God is just like us? Isn’t that the message of the incarnation? Isn’t that the message we hear at Christmas and then again in Epiphany? That is the message that God’s presence is revealed to us in a human being named Jesus, who lives in Nazareth? If you saw him on a bus, on his way home from work, would you recognize God in the face of a stranger? When Abraham looked up he did what every Near Eastern person was supposed to do when travelers passed by. He followed proper protocol, something that the folks down in Sodom and Gomorrah failed to do in the story that follows. He ran and bowed to them, showing them proper respect. He didn’t ask for immigration papers or their political affiliation. What he did was offer them the minimum of hospitality: a little water to wash their feet and a morsel of bread. He offered them water because when you travel on dusty roads, your feet become dry and dirty. The bread was just enough to give them strength to continue the journey. The three strangers accepted Abraham’s offer and sat down in the shade of the oak trees. What happens next is quite amazing. While Abraham offered them the very minimum, when he ran into the tent, he asked Sarah to bake some bread. From the looks of things, it was a lot of bread. Then Abraham went out and took a young calf and had it prepared for dinner. Finally, “Abraham took butter, milk, and the calf that had been prepared, put the food in front of them, stood under the tree near them as they ate.” In other words, Abraham offered these strangers the best of his resources, so that they might be blessed on their journey. In doing this, Abraham encountered the LORD. Thinking missionally, what does it mean for us to eat with strangers? The message of Genesis 18 seems to suggest that when we welcome the stranger to the Table we show hospitality to God. As Fretheim points out, this carries a bit of risk. So, even as we reach out to the Stranger, we need to keep in mind that some risks might be inappropriate. Still, as Fretheim puts it: “Although we are not always able to identify the presence of God in the midst of life, God assumes flesh and blood in the neighbor. (1 John 4:20).” [NIB, 1:464]. So, what if God is one of us, “a stranger on the bus?” What does this say to us about what it means to gather at the Lord’s Table? Abraham offered the minimum and gave his best. He did this, I believe, because he had already experienced God’s grace. As Sara Koenig writes: “Grace always comes first. Because that grace is there, God’s people can respond with their best. Because we have found favor in God’s eyes, it is possible to welcome God with hospitality and generosity as a favored and welcome guest” (Preaching this Week). When Jesus gathered his disciples at the Table, he offered them his best – himself. The mission of God is rooted in this offering on the part of Jesus!